Late last year, the Australian Grand Prix at Albert Park was in danger of being lost on the Formula 1 schedule. 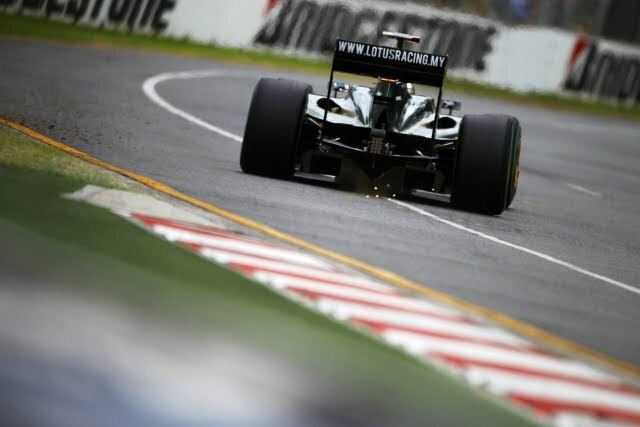 Thanks to a commitment from the Victorian government of Australia and the title sponsorship of Qantas Airways, the Australian Grand Prix was saved. Providing a early season challenge against new race equipment and Formula 1 drivers, the Australian Grand Prix enters 2010 as the first sight of colour to a gray start. Many critical reviews of the season opening 2010 Formula 1 race, Bahrain Grand Prix, judged the event as snooze-worthy. On Sunday, the Melbourne area endured a rain shower that drenched the 3.295 mile Albert Park complex. Though the rain stopped by the time the 2010 Australian Grand Prix started, potential was already mounting for a much more eventful race than the season opener. With the field starting on intermediate thread Bridgestone tires, the start was guaranteed to challenge the 24 Formula 1 drivers struggling for grip on cooler tires. Right off the starting line, the Lotus-Cosworth of Jarno Trulli became the first retirement when his car suffered hydraulic problems. This is the second time this season that Trulli would fall out to this issue. Intent on improving on the lost opportunity at Bahrain, German driver Sebastian Vettel rolled to pole position over his Red Bull Racing teammate Mark Webber in Saturday qualifying. As the lights went off to start the Australian Grand Prix, Vettel shot to a slight lead. With pretty of wheel-banging and contact right off the start as the Red Bull-Renault took off, the initial lap will end under with a safety car leading the all cars. A multi-car wreck between Sebastien Buemi, Nico Hulkenberg and Kamui Kobayashi into turn 6 rendered all three of these racers out of competition. When the safety car returned to pit road, the Albert Park track had dried substantially but the track was still too slippery for most teams to elect a change to slick tires. With many drivers experiencing brief off-track excursions, the only driver who suffered a permanent effect was Renault rookie Vitaly Petrov who slid into the sand trap on lap 9 ending his race. In spite of questionable traction, the drying track tempted the McLaren F1 team to bring Jenson Button to pit lane as the first taker for stick tires. A gamble, Button was running 2nd at this point in the event for McLaren. While Button fought unsuccessfully to completely keep the Mercedes-powered McLaren on the circuit, he would continue to set faster times on the dry weather rubber. Starting with a 1-2 start for Red Bull Racing, Australian Mark Webber lost touch with his teammate Sebastian Vettel early. Webber fell further back as a late call going to slick tires cost him time running on the slower intermediate Bridgestones. With Vettel still leading the hopes for Red Bull Racing, lap 20 would end the day for the German racing superstar. Described as a wheel issue, Vettel's car spun out the track into the turn 13 sand trap. "...I had huge vibrations building up and as soon as I touched the brakes, I had some sort of failure going in to Turn 13 and ended up in the gravel." Vettel commented on the Red Bull Racing website. With Sebastian Vettel out of commission, the McLaren-Mercedes of Jenson Button was able to maintain a comfortable grasp on the lead as he went on to win the 2010 Australian Grand Prix. Finishing 12 seconds behind Button was the factory Renault of Robert Kubica. Running without major incident, Kubica's podium for Renault F1 is the first for the team since the 2009 Singapore Grand Prix. In 3rd position, Felipe Massa brought the Ferrari F2010 home to his Italian race team's first Australian podium since Kimi Raikkonen's win in 2007. Following up the effort of Massa, fellow Ferrari driver Fernando Alonso arrived across the finish line fourth. Alonso position at the finish resulted are a hardest fought 3-way battle through the closing laps. Driving his McLaren-Mercedes Lewis Hamilton, attempting to recover lost ground after a pit road penalty, was slip-streaming (referred in the United States as drafting) Alonso's Ferrari with the resurgent Red Bull Renault of Mark Webber also hot pursuit for both cars. With 2 laps to go, Hamilton timed a move into a braking section on the outside of Alonso. Countering the McLaren, Alonso was successful in holding off the charge by braking only at the last minute. Disturbing Hamilton's momentum, the McLaren slowed to make the corner. However, Mark Webber did not react in time to avoid running into the back of Hamilton causing both of their cars to spin out. Losing touch with Fernando Alonso. Lewis Hamilton would finish 6th while Mark Webber would salvage a 9th place result after being his Red Bull-Renault for a front wing replacement. After two races, the Formula 1 driver's championship points sees Fernando Alonso holding a 4 point lead over his teammate Felipe Massa. With a total of three podium finishes in the first two races of the 2010 season and their drivers first and second early in the F1 driver's championship, the Scuderia Ferrari Formula 1 team is off to their best start in years. The Formula 1 cars heads directly to Malaysia for a April 4th running of their county's Grand Prix. In the Malaysia Grand Prix last season, a heavy monsoon downpour led the FIA officials to end the race at 31 laps. Driving for Brawn GP in 2009, Jenson Button triumphed.